The What: Radial Engineering has begun shipping its mPress and Exo-Pod press distribution system. The mPress is a new press audio distribution system that offers near unlimited signal expansion without degradation or noise. The What Else: The mPress is configured in two parts with a master host—the mPress—and a series of external slaves called Exo-Pods. The mPress is housed in a standard 1RU 19-inch rack enclosure and begins with two mic inputs, both of which are equipped with a variable level control high-pass filter to eliminate excessive resonance and tame the proximity effect. For podium mics, 48V phantom power is available and activated using a front panel switch. This is recessed to prevent accidental use. Selecting between the mic channels is done using front panel switches. In order to control ballistics from overly-excited orators, the mPress has been outfitted with two easy to use knob limiters for threshold and release. "The traditional press box has always been presented as a suitcase with a mic input and a host of mic outputs,” said Dan Fraser Radial senior engineer. “In the past, transformers performed the task of splitting the signal and providing isolation against hum and buzz caused by ground loops. In recent years, the use of active signal buffers has replaced the transformer as a means to cut manufacturing costs. Unfortunately, this has resulted in noise creeping back into the audio system, deteriorating the audio quality. The mPress solves the problem by combining a high-octane active drive circuit with a host of transformer-isolated floor boxes called Exo-Pods. This modular approach allows the system technician to distribute Exo-Pods throughout the press gallery while assuring each member of the press receives a clean, hum-free signal. To ensure no digital trickery is at hand, the mPress is 100 percent analogue." There are eight specially designed balanced outputs, with two on the front panel, and six on the rear. Each of these may be configured using a recessed switch for mic level or high output drive to feed an Exo-Pod. This allows the mPress to be used as a 2x8 distributor for smaller events or expanded by adding Exo-Pods on the outputs. 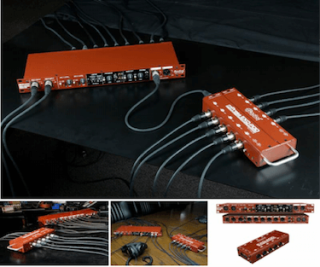 The Exo-Pod is a passive floor box that features an XLR input, a throughput for expansion, a local level control plus ten XLR mic outputs and four 3.5mm mini TRS outs for those who are equipped with a mini recorder. A test tone may be activated to set local and master levels. With the use of eight Exo-Pods, one can distribute the signal to as many as 112 users. This can be further expanded using the throughputs by simply adding more Exo-Pods. Power is only needed at the main mPress box and is supplied via an external lock supply that will accept any input from 100 to 240 volts. The Bottom Line: To accommodate 'walk-in' music, the mPress is equipped with 14-inch RCA and 3.5mm stereo inputs along with a separate level control. This enables the mPress to be connected to a couple of powered speakers via the main stereo XLR outputs to provide background entertainment while the gallery waits for the 'talent' to arrive. A headphone output on the front panel is available for local monitoring and troubleshooting.